I finished half my MFA in the 90s at Bennington, and went back in 2007 to finish up at Antioch LA. In order for Antioch to take my Bennington credits, I had to do the equivalent of 1.75 years work in a year. Therefore, my time at Antioch was a bit of a blur. However, one of the few people who stood out was Toni Ann Johnson. She was smart, ambitious, experienced, and an incredible writer. Years later, when I was querying agents, none of my poet friends could relate to what I was going through. I remembered Toni and reached out to her to talk weekly and support each other around our literary careers. She’s turned out to be a wonderful friend and comrade. Her debut novel REMEDY FOR A BROKEN ANGEL is a mother-daughter story: Serena is a Bermudan jazz singer whose demons lead her to abandon her daughter Artie. Artie’s anger eventually drives her to Serena’s younger lover, Jamie L’Heureux, a jazz superstar. The spirit of Charles Mingus thrums throughout the story as these two women tangle in a syncopated mother-daughter relationship. This road was long and twisty. I completed an early draft of this novel at the end of 2005. Early in 2006 my screenwriting agent at The Gersh Agency gave it to the agency’s “books to film” agent who gave it to a New York book agent who agreed to represent it. That agent sent it to several large presses and it didn’t sell. The agent said she’d keep trying and that “we’d make it happen,” but I stopped hearing from her. Around the same time (2006), I decided to go back to school to get an MFA in Creative Writing. I took a couple of years to do that, and worked on some other writing projects, for a few years. In 2011, I decided to back to the novel and rewrite it. I focused on the book for about a year and at the end of 2012, I had a new draft. Gave it to a few colleagues, got some great feedback and some pretty negative feedback. The good feedback bolstered my courage. The negative feedback, which was from someone I hoped would get it, flipped a switch in my head, and I decided that if it were the last thing I did on this earth, I would succeed despite that criticism. I dusted off the manuscript again—did a polish and addressed any notes I agreed with. There were notes that I did not agree with, which were that the book didn’t work, wasn’t plausible, and that the POV should be limited to one of the main characters, not both. After the polish, I contacted the former book agent. Said she’d read it. I waited. Six months went by and she hadn’t read it. I sent it to two more agents. Both passed with very kind words. The first agent said he loved the writing but didn’t feel the book had a commercial hook. The second agent said she loved the writing, but felt it was a hard sell. I queried other agents. None requested the manuscript. A well-established novelist, the mother of one of my friends, recommended the book to a small press. The owner of that press (Akashic) wrote me to say that the book was seriously considered and had gone to committee, but among their small team they needed a unanimous decision and they did not reach one, so they had to pass. Very disappointing, but the fact that it went to committee encouraged me enough to feel that I could keep submitting to small presses and sell the book without an agent. I found my publisher, Nortia Press after researching small presses that publish literary fiction. I queried the owner in May of 2013. He wrote back within a couple of weeks and asked to see the full manuscript. Mid-July of 2013, I was leaving an audition when I received an email asking if the rights were still available. On the night of my birthday, July 28th, I signed my book contract. The book was released June 10 of 2014. So, from the first attempt to sell it until then, it took nearly 10 years and a lot of rejection. I studied acting at the Lee Strasberg Theatre Institute in New York City for most of my teenage years, from age 14—19. I started in “The Young People’s Program,” and then moved on to New York University’s Tisch School of the Arts, which was affiliated with the acting school. I thought I’d be an actress, but I always expected to write as well. Occasionally, I still act. And when I write, I’m acting all the parts—I play them as I write, complete with hysterical laughter sometimes and gut-wrenching sobs other times. It’s the only way I know to do it. If I’m not feeling the psychological and emotional connection to the characters, it’s not working. I learned to write via improvisation training as an actor. That’s why I started with dramatic writing and was a playwright, and a screenwriter before I learned how to write fiction. Oh, yes. It was a wonderful and horrible experience. I was hired to act in an industrial film for Xerox in Rochester, NY. This was in back the 80s. I was on a small plane from New York City to Rochester and JAMES BALDWIN was on the plane. It was not a crowded flight. I got up to go to the bathroom, and as I walked back to my seat I saw him sitting a few rows ahead of my row. I gasped. Gaped at him. I stood there, frozen, with my mouth hanging open. He looked at me and smiled, nodded. I think he was amused. And I could not speak. I said nothing. I finally smiled a little and hurried away, embarrassed. Part of me wasn’t absolutely certain that it was him. And I hoped it wasn’t. But it was. The next day his picture was in the Rochester Newspaper. He was receiving some sort of honor there. One of the few regrets of my life is that I didn’t tell him I admired him and that his work meant so much to me. I think he could see it in my face, but I was too shy to articulate it. Ha! Yes. My mother’s side of the family came to see a reading of one of my first plays, Mommy Loves You. It was at The Henry Street Settlement in New York City. The play was inspired by my mother’s experience. However, large portions of the story were wholly fictional. Or so I thought. In the story, a couple has a child. This couple met at The High School of Performing Arts in New York City. The young man was upper middle class, African-American, and from a light skinned family with a controlling mother. The young woman was brown skinned and in the foster care system. She got pregnant. The boyfriend’s domineering mother used her money and power to keep her son from being involved with the child. In my mother’s real life story, her biological mother couldn’t care for her, she was put in foster care and a more stable family took her in and eventually got custody. They adopted her. There was no romantic relationship. I made that up. What I did not know is that the man I called Grandpa, who adopted my mother, had the experience I wrote about with his own mother (the experience I gave to the son in the play). My grandfather got a young girl pregnant and his mother wouldn’t allow him to marry her—for the same reason’s the domineering light-skinned, middle-class mother in the play won’t allow her son to marry the mother of his child. So, my uncle thought the child in the play was based on him! And after the performance he said, “That’s exactly what happened.” I had no idea what he was talking about. What was even worse was that I made the huge beginner’s blunder of using my mother’s family’s name. The “Peterkins” sat together in one row and when they heard their name mentioned on stage, there was a collective gasp. I don’t think they ever forgave me. The only one who wasn’t angry was my Uncle. He loved it! The rest of them never came to another play. They never commented on any of my produced films. They didn’t even come to my wedding. Only my uncle came. Yes. My good friend Kate Maruyama is usually my first reader. She’s a brilliant, talented writer and a marvelous teacher. I admire her work and I’m always happy to be a reader for her as well. She’s someone I can take criticism from, because I know she respects what I do. If a piece has problems, she’ll point out what isn’t working, while also commenting on what is working. Sometimes people can read and critique in a way that I find condescending and unnecessarily unkind. These are people who read solely to point out flaws. They’ll tell you every mistake they think you’ve made without any comment on what’s working in the piece. For me that’s more harmful than helpful. If I come away from a critique feeling demoralized, it takes a while to build back the confidence to face the work again. Kate can point out a story’s problems in a way that leaves me inspired to correct them, which is more productive than being left angry, or crying for several hours and contemplating suicide, which has happened. 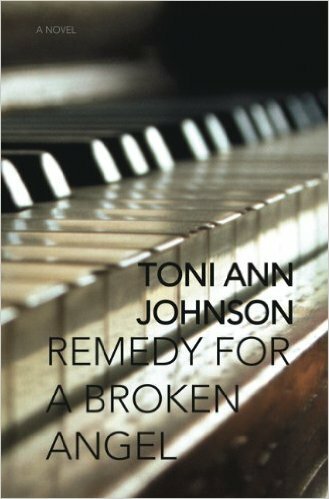 GIVEAWAY: Comment on this post by Noon (EST) on Friday, January 8 to win a copy of Toni Ann Johnson’s REMEDY FOR A BROKEN ANGEL. Follow The Debutante Ball on Facebook and Twitter for extra entries—just mention that you did so in your comments. We’ll choose and contact the winner on Friday. Good luck! Great interview, Aya. I learned a little more about Toni Ann. Looking forward to reading your book this year! What a great interview with such a gifted person! I loved Ruby Bridges! What an impressive and talented woman with so many wonderful projects and ideas. This novel would be memorable and very special. What an interesting and lovely interview. Learning about this creative woman is great. I enjoyed this post about this amazing actor, writer and playwright who has won awards and accomplished a great deal. The book sounds incredibly fascinating.